14 times higher than the Great Pyramid of Giza and designed to house 750,000 people, the technology to create this massive structure doesn’t yet exist—the super-strong, lightweight materials required are still in development. 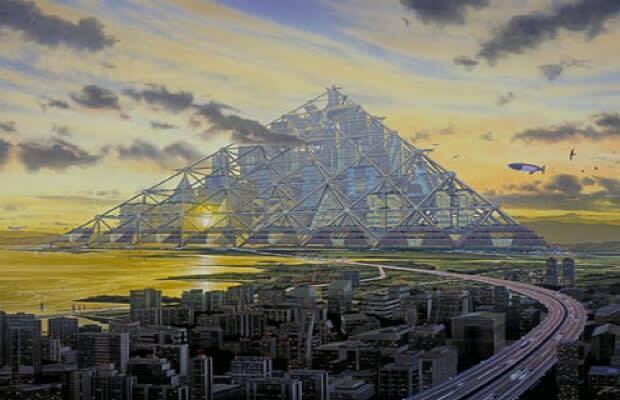 Floating over the Tokyo Bay, the mega pyramid would be comprised of 204 smaller pyramids stacked eight high. Photovoltaic film covering the outside of the structure or fuel cells powered by algae would generate power for the moving walkways, elevators and automated pods that would move people around the residential, commercial and leisure areas.